Who knew? Washington, where my sister married her gorgeous new husband, has the highest concentration of craft distilleries! 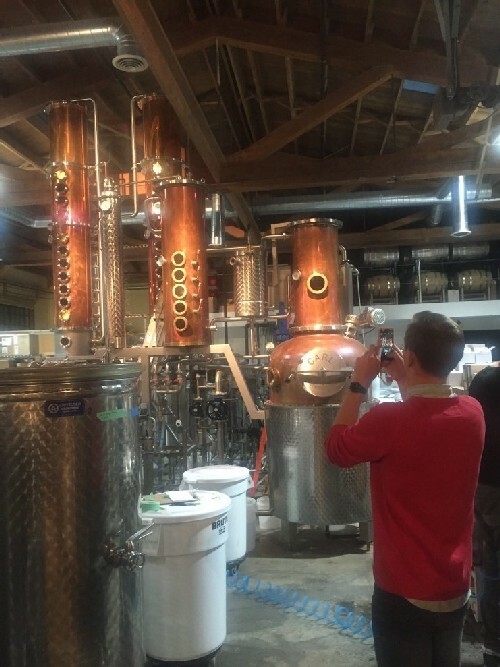 So after all the wedding-related business was over, Matt and I sternly told our livers to toughen up, slightly postponed the beginning of our road trip, and we threw ourselves into experiencing as much of the Seattle Distillery Scene as we could. We started at some of Seattle’s most established distilleries. All were incredibly accommodating when we told them that we were a couple of crazy Australians trying to start our own distillery in Patagonia - we were encouraged to ask all manner of weird technical questions and they gave us experiences that we could only dream of! We got to taste aging whiskey straight out of barrels (which I’m pretty sure is completely illegal) and we even got to hang out and taste cask samples in an actual blending room! (also illegal!). All of these distilleries made some really great Whiskeys and Bourbons (there is so much more to Bourbon than we get to experience in Australia! ), but visiting them didn’t instil a whole heap of confidence in our future plans because they each had budgets of 10 to 30 times the size of our budget! Thankfully some of the next distilleries we visited made our plans look positively lavish- yet they still churned out some AMAZING products! One of our favourite examples of this was a distiller who made an incredible limoncello, just from raw ingredients (wheat, barley, lemon peel and honey), using a 44-gallon drum heated with a hot-water system coil and topped with two little packed copper columns that fed a bucket! 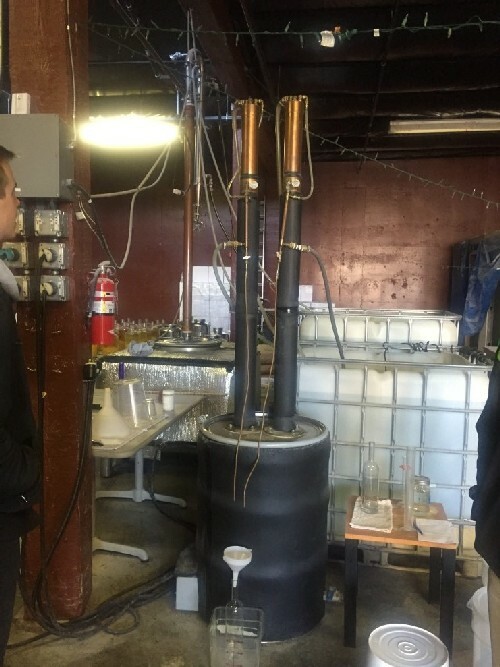 Other distilleries showed us that IBCs (big plastic tubs) can be used for almost anything, that cheap Chinese equipment can be a legitimate option, and that rustic nonconventional set-ups without any of the textbook prescribed accessory equipment can work just as well as the fancy systems. Along with 100’s of tips and short-cuts recommended from lessons learned the hard way, our visits have left us far more confident in our own Patagonian plans. By far our best experiences were at the two distilleries that kindly let us help-out for a day at their distilleries. 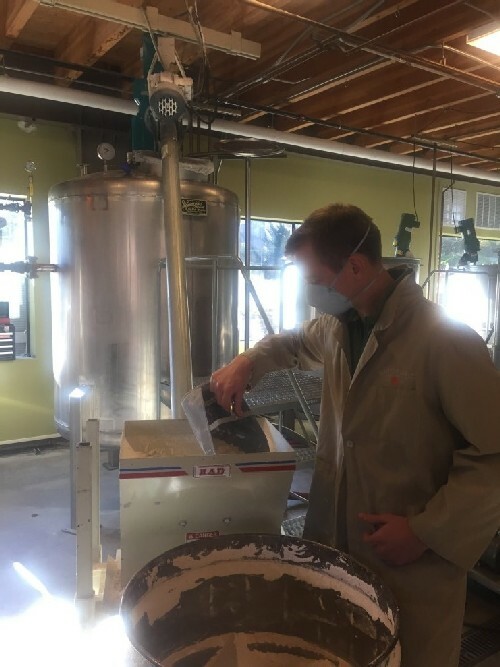 Actually connecting hoses, manually controlling temperatures, measuring and heaving buckets of grain and taste-testing various stages of fermentation were learnings that you just can’t get from books or tours! We learnt things like that even with a pallet-jack, 1000L tanks take some muscles to move; when making gin, you need to take really good care to make sure everything else doesn’t taste like gin forever after; and you should never stick your head in a tank to have a big whiff – you’ll feel like you’ve burnt off your nose hairs! 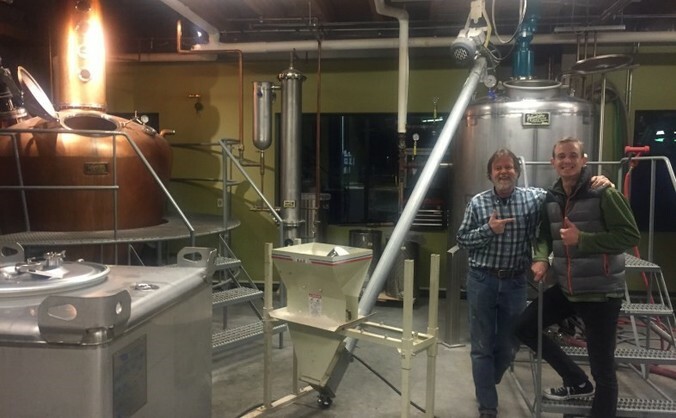 If you’re ever in the Seattle area we cannot recommend Bainbridge Organic Distillers and 2 Bar Spirits enough! 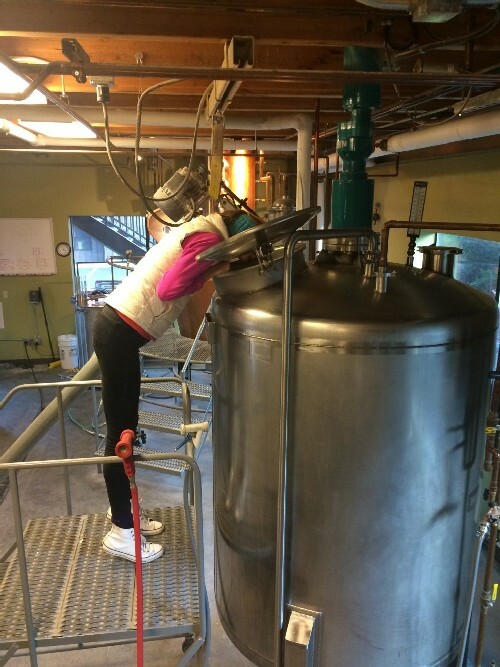 But we are also absolutely grateful for every Seattle distiller that generously gave us their time and invited us to keep in touch should they ever be able to help us with anything.